Good morning, my creative home renovators! With the Holidays right around the corner, Cutting Edge Stencils is betting that you’ll be spending more and more time being crafty in the kitchen. How’s that ol’ kitchen looking these days? If dated and drab are the first words that come to mind, then we have a project for you! Now is not the time to take on a huge renovation project but a small stencil enhancement can go a long way in terms of decor. 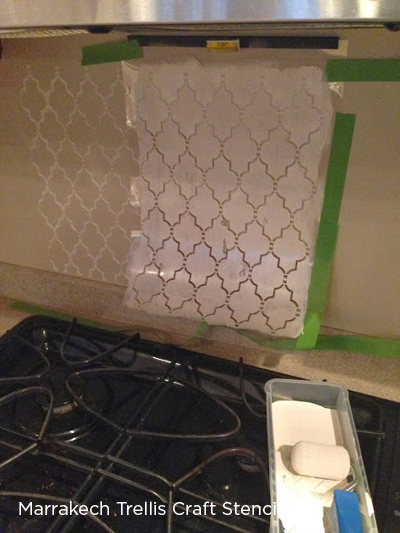 Remember when we shared the stenciled kitchen backsplash trend in this post? Well since then we’ve been spotting these painted and stenciled backsplashes everywhere. Just like this one that we found on Pinterest. 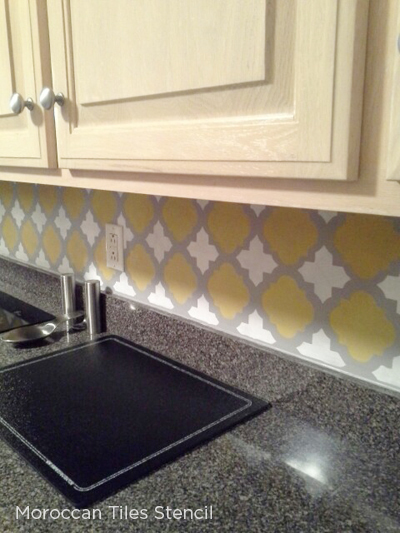 Beth spiced up her kitchen by painting our Moroccan Tiles stencil in a fabulous gray and yellow color combination. Our facebook fan, Anuradha, sent us this stunning picture of her kitchen. She said, “Customizing our first home was a piece of cake. 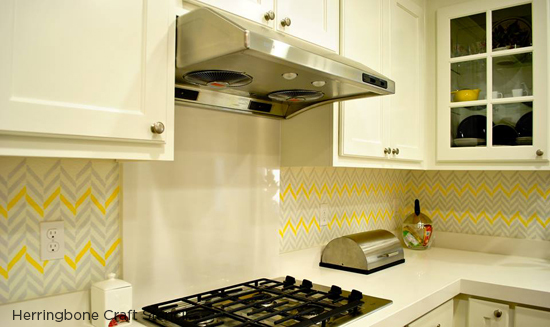 I used the Herringbone Craft Stencil for our kitchen backsplash and I am totally in love with the result.” It’s looking pretty good, don’t you think? Even our Instagram fans, like The Diana House, have picked up on this inexpensive kitchen trend. She used our Marrakech Trellis Stencil in a cool silver metallic to give the heart of her home a little patterned punch! We love it, don’t you? The kitchen was very pretty but the backsplash was plain. Cheryl’s stenciling light bulb went off and she decided to dress up the wall using our Marrakech Trellis Craft stencil. 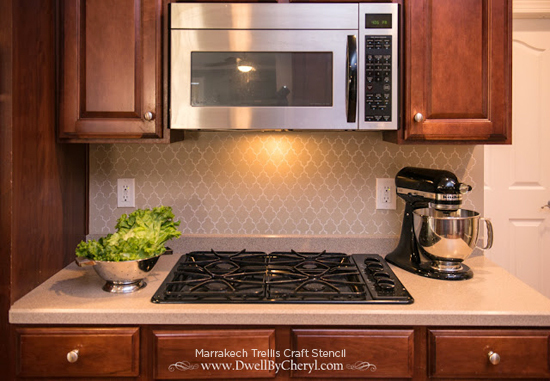 Cheryl used our clip-on stencil level to ensure the stencil was positioned evenly on the wall and green painters tape to keep the craft-size Moroccan design in place. 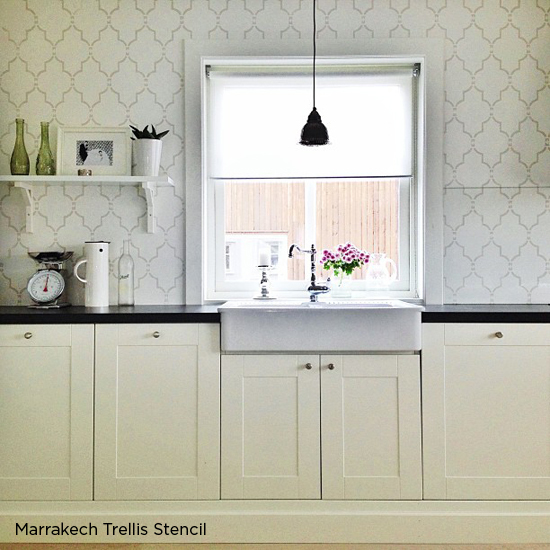 Just look at how a stencil pattern can enhance the kitchen! 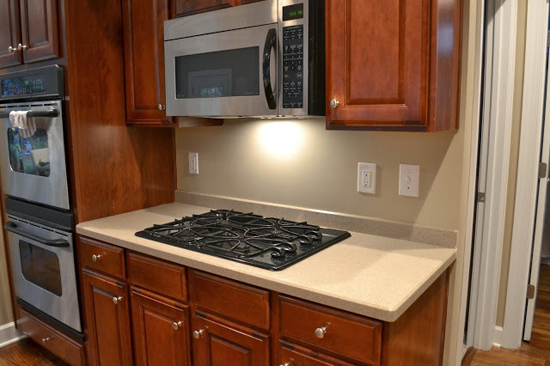 Cheryl had this to say about her newly stenciled space, “I think it totally does wonders for the kitchen.” We have to agree that it is pretty lovely! Great job, Cheryl. To steal this look, try using Benjamin Moore’s hillsborough beige 1033 for a base coat and simply white OC-117 for the stencil. Would you dare to stencil the backsplash in your kitchen? We’d love to hear thoughts in the comments below! Shop our stencil designs and find the perfect stencil for your kitchen project! Outdoor Stencil Projects To WOW Your Guests! Recreate These West Elm Looks Using One Stencil!